Buccigross: See you in September! John Buccigross joined ESPN as an anchor in October 1996. He currently can be seen as an anchor on "SportsCenter." Buccigross frequently contributes to ESPN.com during the season. There are multiple reasons why the United States economy is hurting many citizens not named Barry Melrose or Ron Wilson and causing general pessimism over the economic future. The housing crisis and oil prices are two major factors. Eating seven nights a week at Applebee's doesn't help, either. The housing crisis, as Robert J. Shiller writes in this month's edition of The Atlantic, has many contributors, from lenders to borrowers to financial institutions; but perhaps the biggest culprit in Shiller's mind is the speculative nature of America. always said (while sitting at the kitchen table in his South Boston triple-decker as we played "Acey-Deucey"), "You've got to speculate to accumulate, Jawwwn." Uncle Kenny also speculated in Narragansett beer, lottery tickets and Winston cigarettes. America has always loved to speculate. George Washington was a land speculator. Speculation is in the USA's DNA. You know how it works. We present an NHL photo, Bucci provides a caption, then you weigh in. Check back for more pictures next season! No, no; you gotta exfoliate with the pumice, then cleanse with the toning lotion for optimum beard growth. Didn't you get that brochure I sent you?" "What do you mean you forgot the pickles on my Big Ben burger?! I am sending Gary Roberts over there right now!" "How could you miss that call? It was so easy a caveman could have made it!" Between 1997 and 2006, home prices in the United States rose 85 percent. Like Jason Giambi's moustache (on loan from Dave Tippett), there was no real reason for the increase; rising prices often hypnotized people into getting into the game before it was too late. We have plenty of residential space in the United States. What we had over the past decade was "boom thinking" on a wide-scale basis. (Sweden, Mexico and Japan went through this in the early '90s). It seemed like everybody was getting into the real estate game. Borrow, buy, sell, refinance, cash out, smack it up, flip it, rub it down, rent, lease, borrow, rinse and repeat. We went from a Protestant/Boston Bruins work ethic to the stock-market boom of the 1990s. This seemed to change people's thinking on how to get things done financially, and only now have we seemed to hit a brick wall made of thick credit-card plastic. This kind of "boom thinking" is also what the New York Rangers and other NHL teams implemented in the late 1990s as the Blueshirts signed Theo Fleury, Valeri Kamensky and Stephane Quintal, to name three. "Boom thinking" is often associated with bad information and bad arguments that can lead to long-term pain. The Rangers failed in their "boom thinking" -- miserably. From 1997-98 to 2003-04, the Rangers missed the playoffs, and their thinking inevitably led to a bust because "boom thinking" doesn't typically work in hockey (also see the Toronto Maple Leafs of the past four seasons). Hockey is a blood sport and the heart is the essential blood organ. A life can only be a life with something to be enthusiastic about. This is the value that is needed to turn heart into a commodity. Everyone who loves skating has heart, but everyone who skates isn't a hockey player. Courage carries the heart and the dreams around the rink. No sport combines the aerobic and anaerobic strength of ice hockey. Every stride, every shift, every day has purpose. Hockey is not meaningless, for it is life, and every bit of life should be purposeful. A life is only a life if you have the mental toughness to make every breath purposeful. To be a great artist you must be a great thinker. You must expand the mind and train the mind to see things, to understand how things work, to think life. Thinking life is observational learning, experimentation and recall -- watching how things work, trying new things and applying them into action. Those values were contemplated and written with the hockey player in mind. 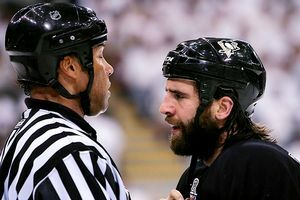 In the Stanley Cup finals, we saw heart from Brian Rafalski and Max Talbot. We saw courage from Ryan Malone and Niklas Kronwall. We saw mental toughness from Henrik Zetterberg and, yes, Marian Hossa. We saw artistic expression from Nicklas Lidstrom and Sidney Crosby. Johan Franzen, Chris Osgood, Marc-Andre Fleury, Tyler Kennedy, Brooks Orpik, Pavel Datsyuk, Kris Draper and others were also examples of hockey's value system. But these values can also be used to own, coach and manage players and teams. It is these values, not "boom thinking," that make us feel proud of our game. Yes, the Red Wings and Penguins were the last teams standing because they have great players; but it was also because they own, coach, manage and play with the values of the game in their cell structure. Only the salary cap (socialism) can break them apart. As fans of the game who give our money and time to the sport, this should make us proud. Nothing comes easy or cheap on the road to the Stanley Cup. Our champion is 100 percent deserving. This is also true for NCAA hockey, Canadian Junior, Minnesota high schools and every hockey trophy from mite to beer leagues. Staying away from "boom thinking" has kept the Red Wings consistently excellent from top to bottom. Their portfolio has netted four Stanley Cups since 1997. They live in an old, rundown ranch, but they have no mortgage payments and, thus, live below their means. They rely on smart, reliable investing by focusing on the draft (small, unproven companies) and plugging holes by taking calculated risks in the expensive world of free agency (safe, blue-chip stocks such as Rafalski). They are coached with a Western Canadian value system, which means you reap what you sow. *-You work, you save, you sacrifice, you play hurt, you don't call in sick, you laugh, you cry, you care, you give, you drink beer and you never give in. Right to your last breath. We can approach college this way. We can approach our jobs this way. We can approach investing in this way. We can approach our golf game this way. We can approach parenting this way. If we do, we will have a rich life. A Steve Penney saved, is a Steve Penney earned. Teach your children well. Have a passionate summer and revel in life's rich pageant. I am a twenty-something, single, attractive, intelligent woman who loves hockey. Why can't I find a decent man to go to hockey games with me? Maybe it's your lack of self-confidence? Did you get to see the CBC coverage of Game 6 (which ran until midnight ET)? They closed out with a montage of every Red Wing doing a face shot and saying his name, hometown and favorite player growing up (Pavel Datsyuk had none?!). Mikael Samuelsson had two and I can't for the life of me remember the first one (perhaps Borje Salming). I forgot because I was so excited with the identity of his other favorite -- Hakan Loob! Chuck Norris's beard is made from Hakan Loob hair clippings. Over the weekend, I was at a party and got into a few cocktails. Ended up playing that ESPN trivia game. My partner and I were huge underdogs since the other two guys pretty much spent all day reading about sports. We pulled off the huge upset. The biggest reason: There was a question about what ESPN anchor coined the phrase "Winner, winner, Chicken Parm dinner." I got that one right off the bat without even hearing the multiple choice options. A big five points gave us the commanding lead. The crowd was silenced. Once again, reading your column makes people more popular at parties. Thanks for the assist. Last Saturday night at ESPN, I ate an entire bucket of Kentucky Fried Chicken. I practice what I preach. Big time. Greetings from South Jersey. My girlfriend is about to head to Alaska for three months to do a working vacation kind of thing, and we thought we would each choose a book that we would both read and could e-mail back and forth to talk about it. She chose "Water for Elephants" by Sara Gruen and I chose "Jonesy." She's becoming a hockey fan ever since I took her to Game 3 of the Flyers/Caps series, and she fell in love with the game. I'm hoping the book helps her passion along a little further. Just thought you'd like to know that you and Keith will be bringing us together a little more, even from far across this great nation. Well, this is the final shameless plug for the book that swept the nation. If you haven't bought your copy of "Jonesy" yet, or even if you have, buy three more today. Summer beach reading season is here. Thanks for your patience all year. Hockey fact: The Red Wings have won four Stanley Cups in the past 11 years, just one fewer in the history of the Boston Bruins, as many as the New York Rangers have won in their history and one more than the Blackhawks have won in theirs. I've been an avid reader of your column for some time now, and to be honest, I think it's the best column out there. It has everything -- hockey, music, humor and his Royal Loobness (I thank you for introducing me to him!). I read that you're only going to plug the "Jonesy" book for two more weeks, so I thought I'd better use my work time to get a writin'! I loved the book. I picked it up and couldn't put it down and I'm due for another read. I can't recommend this book enough and will certainly be waiting for your next literary masterpiece! That might be my favorite e-mail of the year. On so many levels. Oops, and another "Jonesy" plug. OK, THAT was the last plug. Hockey fact: Paul DiPietro played 17 games during the 1993 Montreal Canadiens' Stanley Cup run. He had eight goals and five assists. I write this e-mail to you as a 23-year-old, die-hard Penguins fan from the Jersey Shore, whose team people are finally taking notice of after all of those years spent in the basement of the NHL. I've been a Penguins fan since the late '80s, when I started watching hockey, and it's been awesome to see the metamorphosis of the most resilient team in all of sports -- through all the good times, then the hard times and now the good again. But this e-mail isn't just about my praise of the Penguins, it's just as much my way of trying to say thanks for writing your column. I love reading it, and "Jonesy" is one of the best reads out there. And after years of reading and watching you on ESPN, I've come to realize what I want to do when I grow up. First rule of hockey, Tony -- don't grow up. Thanks to you and everyone for clicking on this column each week. I am the lucky one. And did you HAVE to mention "Jonesy" again? Hockey fact: The first season the NHL took control of the Stanley Cup was 1926-27. There were five U.S.-based teams (New York, Boston, Chicago, Pittsburgh and Detroit). Love reading your column every week and "Jonesy" was a great read on my flight to Vegas for March Madness. OK, now I think I'M going to puke. Time to go. Here's a pic of mini-me for your column. Introducing Joshua George Discher. Born May 26, 2008 at 11:30 a.m. at 6 pounds, 9 oz. A stay-at-home defenseman in the Scott Stevens mold. Eligible for the NHL draft in 2026. Could go at No. 20 for the Devils, assuming the Islanders take Scott Scissons' kid at No. 6 and the Leafs select Drake Berehowsky's kid at No. 10. Cute little Devil. I wish him heaven. John Buccigross is an anchorman for "SportsCenter" and ESPNEWS. For questions, comments or crosschecks, e-mail him at john.buccigross@espn.com. To check out his new book, "Jonesy: Put Your Head Down & Skate," click here.